bestia.io | Processing : coming around. "Processing is a simple programming environment that was created to make it easier to develop visually oriented applications with an emphasis on animation and providing users with instant feedback through interaction. 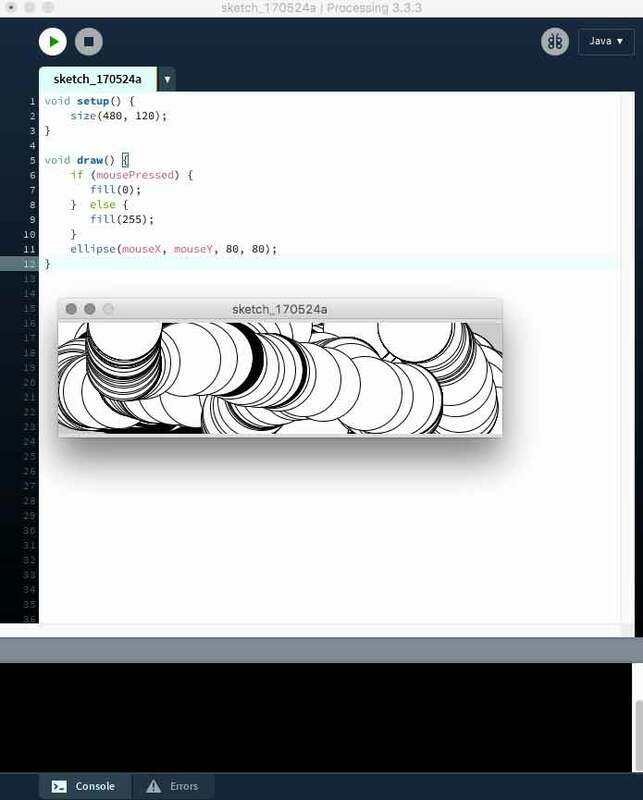 The developers wanted a means to “sketch” ideas in code. As its capabilities have expanded over the past decade, Processing has come to be used for more advanced production-level work in addition to its sketching role. Originally built as a domain-specific extension to Java targeted towards artists and designers, Processing has evolved into a full-blown design and prototyping tool used for large-scale installation work, motion graphics, and complex data visualization." First thing, it is a good idea to download Processing. I started with the Getting Started page on the Processing website. You can do that too. I do not know if it is the clear similarities between the Processing Development Environment (PDE) and Arduino IDE or a flood of old memories returning, but this feels very familiar. Like an old blanket. In this sketch, void setup runs once and void draw loops infinitely. Here is a nice graphic from the website explaning the interface. After a few minutes of following through the tutorials linked above and below, I decided to just jump in. Enough with the tutorials. Tutorials have their place, but how many different ways do I really need to draw a circle right now? I want to get this connected with my boards! I edited a previous Arduino sketch for greater simplicity. This sends data from the phototransistor to serial for interacting with Processing. Immediately, my mind went back to the timing problems I have had over and over and over again with these ATtiny 44 boards. What am I missing here? 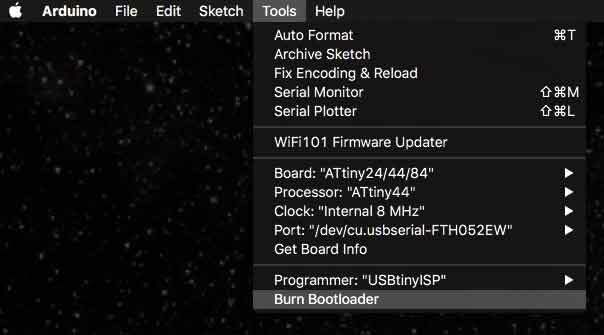 I searched around, rolling it back to the start and I found I never used Burn Bootloader. All this time. After doing that step, the timing and serial BAUD rate issues melted into distant memories of resilient night terrors. One thing though, the external clock Bootloaders are not working. I will come back to this another day. I think, the resonator is a tough piece to solder, I have already decided to increase the pad lengths next time I use it. I will test this on other boards I have with similar setups and diagnose after that. For now, I am using the 8mHz internal clock. Still using an example code from the bottom of this page which is a processing conversion of Neil Gershenfeld's python phototransistor reading script, my processing readings did not match the Arduino serial readings. I stripped the sketch down to its most essential elements for transimitting information from serial and still did not have parity with Arduino. 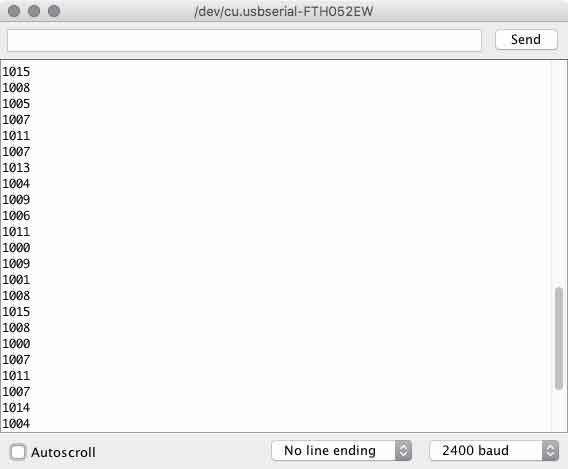 Finally, on the Sparkfun tutorial data is read from serial and stored in a String, instead of an int. A string is a sequence of characters though. This may be a problem. Now I am having some fun with tutorials, so I continue with the next communicating from Processing through my board, to Arduino and back to the board. First the processing sketch. When I perform a mouse click within the processing menue, a 1 is written via serial. Arduino recognizes that and illuminates the LED. And it works. I want to communicate both ways. Apparently, this is called a handshake. Again, following the guiding hand of the tutorial. The Arduino adds a boolean function for controlling the LED and setups an additional loop to confirm communication with Processing through the board. When there is no communication from Processing, it asks for some. Processing adds and if / else statment within a serialEvent void for confirming contact (based on a new first contact boolean and listening for an "A" from Arduino). Arduino knows there is contact when it receives any kind of meesage through serial. Then, Processing prints whatever is communicating over the serial port and in case of a mouse press, sends a 1. When Arduino sees the 1, it flips the ledState boolean LOW/ HIGH. If you disconnect Processing and try to reconnect, the board needs to be reset because the first establishContact has already taken place on one side while the processing side will wait forever. 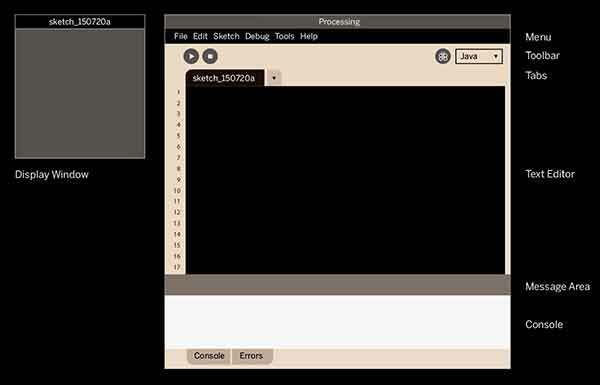 Arduino x Processing : Sparkfun tutorial for communicating between the applications via serial through a board. Processing links : Links and examples that pertain to Fab Academy especially. Download Processing : Get some. Processing Main. : Getting started, loads of digestable, thorough information here.